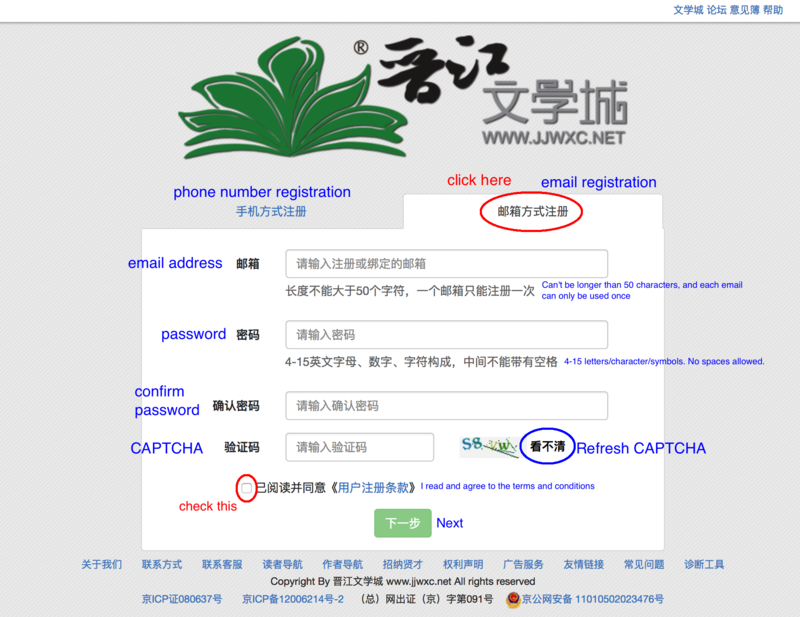 I’ll show you how to register on JJWXC first. 3. 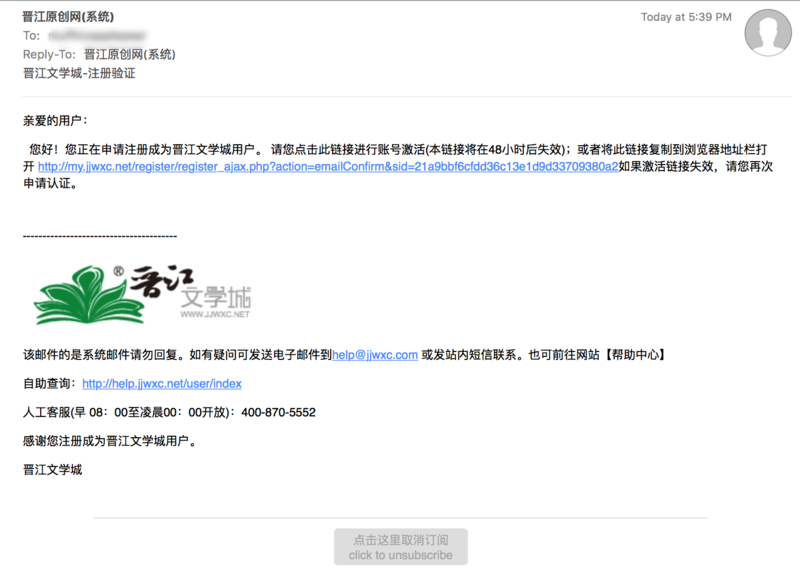 Click Email Registration [邮箱方式注册] because you don’t have a Chinese phone. 4. Fill in the registration form. For the password, I don’t recommend using a password that you use anywhere else, because honestly I don’t trust the security on Chinese websites. Make sure you enter the CAPTCHA and check that you agree to the terms and conditions. 5. This says that a confirmation email was sent to your mailbox. Please confirm your email within 48 hours, and there’s a chance it may have ended up in your spam box. 6. This is what it looks like in my email mailbox. Just click the link the confirm your email. 7. This says congratulations, you’ve confirmed your email. 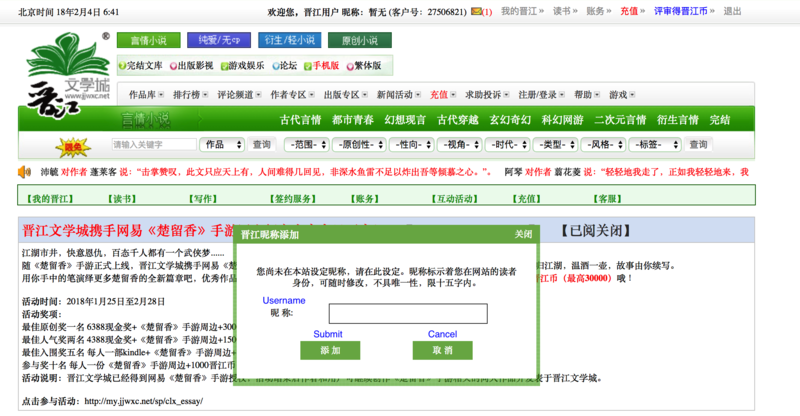 You will be redirected to the login page in X seconds, or alternatively, [click here] to login. 9. Enter your email address and password. 10. The first time you log in, you’ll get this dialogue box that pops up that says that you haven’t set a username yet. The username is your unique display name as a reader on the website. You can change your username whenever you want it and it must be less than 15 characters long. You have to pick a username that nobody else has used yet, but fortunately usernames using the English alphabet aren’t popular, so it should be pretty easy to make one. 11. Success, you have set your username. Just click the confirm button. 12. At this point you should be logged in. 14. 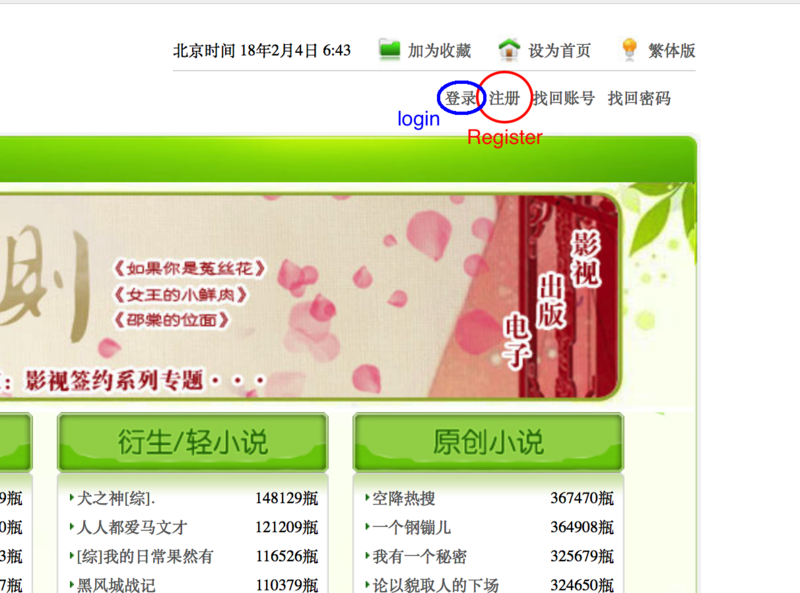 Or you can log in through the [Login] (登录) button which is like everywhere on the site. 15. It’s pretty straightforward… just your username/email and password. 16. You might get a message like this after successfully logging in. This says that you haven’t set your phone number yet, and it wants you to set your phone number. 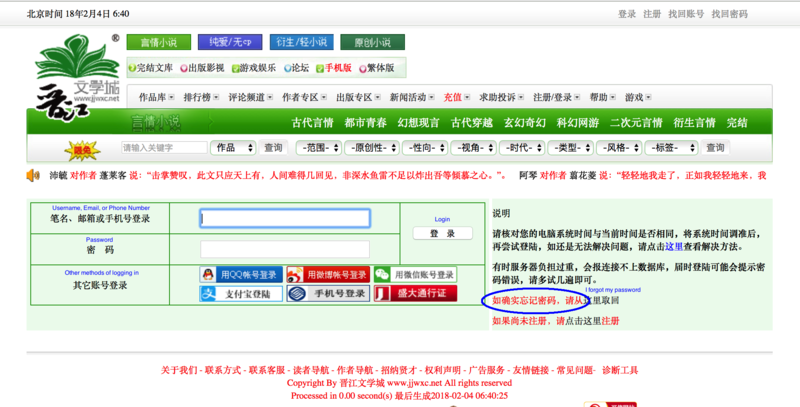 However, we don’t want to set our phone number, so click the right option [Do it later] (暂不实名). You may have to do this every time you log in. Congratulations for getting this far! As a special treat, I’ve translated the author’s user profile, which you can find here. Da Yuan Zi (大圆子), if you remember, literally means: “Big Round Ball”. It’s a reference to Tang Yuan (lit. 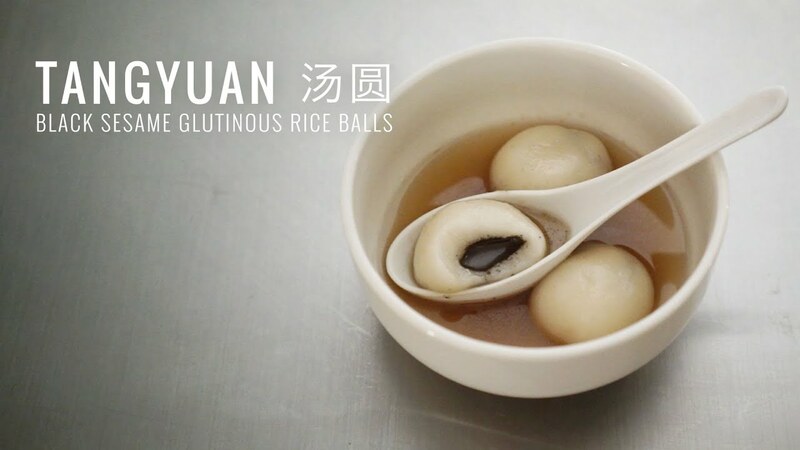 “soup balls”) which is a sweet holiday snack that is traditionally eaten during the Lantern Festival. These are round rice balls that are usually filled with black sesame seed. You see the wikipedia page here. Money is empty, power is empty, literature empty. 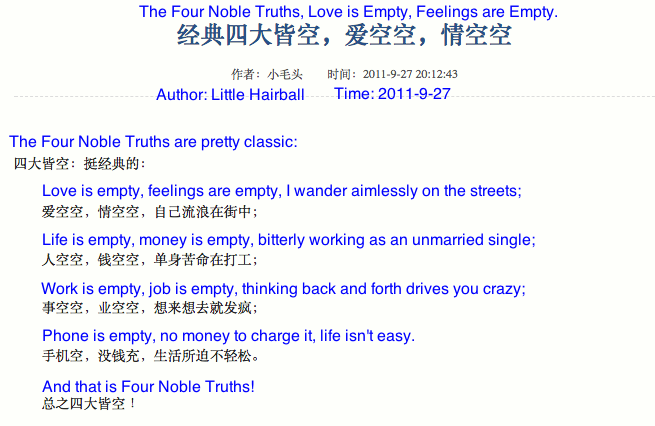 My writing is silly, this person is silly, this pen name is silly — a round ball that loves everyone. If you hit [collect this author] above, you can collect a big ball. In Buddhism, a person who has obtained the Four Noble Truths has achieved ultimate enlightenment by ridding themselves of worldly desires. It’s like becoming a wizard after 30 years of being single!!!! Wait a minute, isn’t that kind of depressing…? Anyways, what Da Yuan Zi is telling us here in her profile is that she’s a poor, small-time author that doesn’t get that much attention. She’s cute and funny and makes too many puns. Most importantly, she tells us to subscribe to her by hitting [collect this author]. The number of subscribers that an author has is extremely important to new authors on JJWXC. In factor, authors cannot sign a contract and make money unless they have enough subscribers. This is so important that Da Yuan Zi basically tells everyone who visits her user profile to subscribe to her! It’s simple, easy, free, and just takes a click of a button. If you like an author, the first thing you should do is subscribe. And more importantly, Da Yuan Zi told you to do it, so you should do it, right?!?! 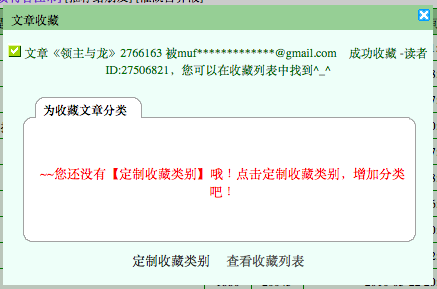 Ah, just as a heads up, if you click [collect this author], you get this message that pops up that reads: ‘Da Yuan Zi’s special column has been successfully subscribed to by: [your email address]. This section is actually a little less important for us in particular, because Lord and Dragon is only one of Da Yuan Zi’s free side projects. She doesn’t make any money off of Lord and Dragon because it’s not a VIP project, and only VIP projects earn authors money. 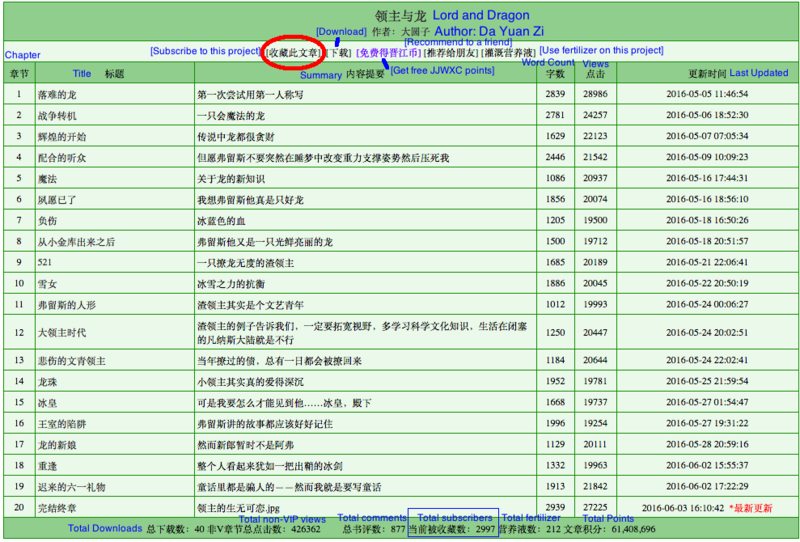 Da Yuan Zi currently has around 23 projects, and Lord and Dragon is like her 10th most popular project. Her most popular VIP project has like 10X as many points as Lord and Dragon. Most authors on JJWXC have multiple projects. This is because authors can’t start collecting money until they’ve completed at least one project. Typically, their more popular projects are paywalled (VIP), while their less popular projects are free and serve kind of like free marketing. After all, if you liked an author’s free project, maybe you’d become curious about an author and want to take a peak at their VIP projects? 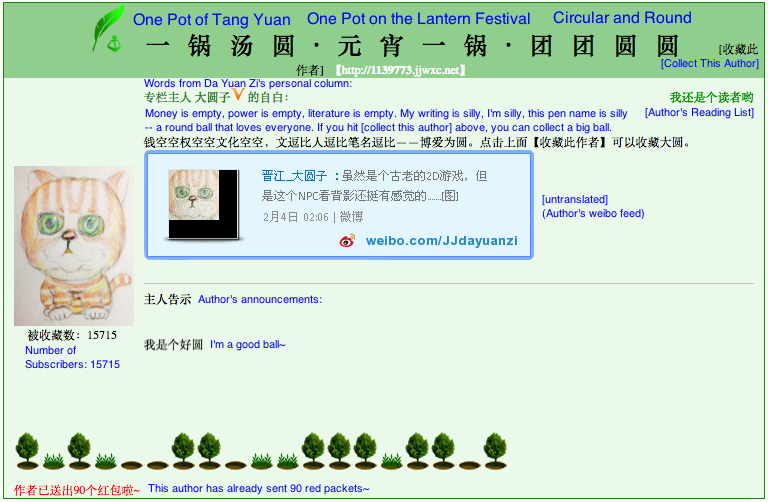 Chinese readers are extremely loyal to their authors! Anyways, I say this because in terms of helping an author out, it’s more important to support them on their VIP projects. Improving the rank of Lord and Dragon (a free project) isn’t that valuable to the author, so you can kind of gloss over this section if you want. This is mostly just FYI. I’ll start by discussing how the front page and ranking works on JJWXC. Novel Points – This is the way the default ranking goes. I’m not totally positive how this is calculated, but it’s definitely related to the number of views a project gets. The more people who read a novel, the more points it gets. You can see the weekly ranking, the monthly ranking, yearly ranking, etc. in multiple different genres/categories. Bomb Leaderboard – This is a ranking for the number of “bombs” that readers have bought for an author’s project. It reflects a little more accurately how willing readers are to show their appreciation for a project with money. We’ll dive into this later. Fertilizer Leaderboard – This is a ranking of the number of bottles of “fertilizer” veteran users have given to an author’s project. Only veteran users who have read/purchased a lot of novels can give out fertilizer in a limited quality, so it’s not easy to obtain. Frequently Recommended – I think this is a ranking of which novels are trending in terms of recommendations users are sending each other. Other – There’s other leaderboards for Editor’s Picks, Premium ranking (authors pay to be on the ranking), release speed ranking, etc. For bombs and fertilizers, it probably only matters the most if your project is in the top 200 or so, because at that point you’re getting close to trending on the front page. Otherwise, you’re probably part of the unranked masses that doesn’t show up on the first few pages of the rankings, which means you’re invisible lol. As you can tell, under the default settings, there are like 5686 pages of results, already filtered for only the complete works. I think when I was looking for Lord and Dragon, I searched for “fairy tales” (童话) and maybe dragon (龙) as a keyword, or something like that. The default sort method, [Number of subscribers] is the one I want to focus on. Here’s how you subscribe to Lord and Dragon. First go to the Lord and Dragon project page. 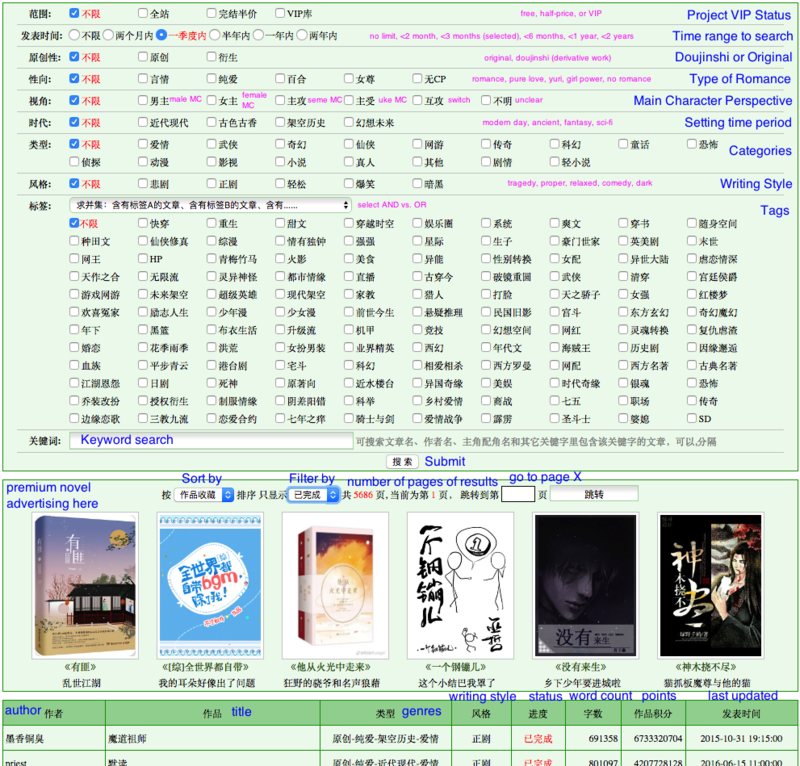 Then click on [Subscribe to this project] [收藏此文章]. This says you successfully subscribed to Lord and Dragon, but you haven’t set up a custom reading list yet. However, you actually don’t need to set up a custom reading list. The novel will just go into the “uncategorized” section, which is fine. You can close out of this dialogue box. I think if a novel gets a lot of recommendations in a short period of time, it starts trending on the front page. However, I don’t think that’ll ever happen with Lord and Dragon since it’s pretty tiny… so personally I wouldn’t really bother, especially since this a free project anyways, and all of you have already read it! In this section, we’ll discuss how to leave comments for the authors to cheer them on. 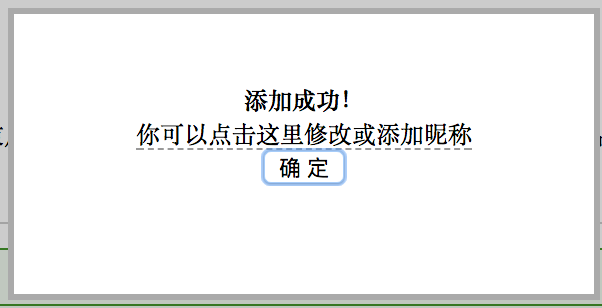 Can’t speak Chinese? Don’t worry! It’s super easy to spam encouraging comments, and we’ll give you a quick cheat sheet. If you have more complicated comment you’d like to say, I’ll even help translate it for you! You have to post it yourself though! You can tag @matcha in the Blob Translations Discord group or simply leave a comment on this thread. I think it’s great when readers want to directly communicate with authors, and I’m happy to help you translate! Step 1: Go to the Lord and Dragon project page. Step 2: Click on the chapter you’d like to comment on. For example, click on Chapter 20, and scroll to the bottom. As you can see, the Chinese readers are very energetic. Make sure you rate the chapter 2 points (2分), which is the same thing as five stars. As for what to write? My general rule of thumb is to pick a phrase and then spam it a few times and that should do the trick. If you want any help though, feel free to leave a comment and we can help you translate what you want to say!